strip of a woven fabric or knit, one end of which extends to a achieve a width determined by fashion (between 30 mm and 120-plus mm). Its typical length is 1.30 m. The n. is cut at an angle, and typically of three pieces; into its back an inset is sewn, and its extended part is lined. The first n. were worn by Roman legionaries, seemingly as a protection against winter weather. It became a decorative item in the 17th century. We distinguish between a single knot (applied in narrow n.), and a double knot, which forms a regular triangle. The n. serves as a decorative clothing accessory, and is worn at the throat. Different types of n. are chosen for different occasions. 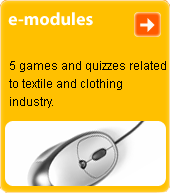 Produced from silk and woollen fabrics; also knitted on round knitting machines with no subsequent processing required.